A great many years ago, when we were younger, Larry Biggs and I worked for the largest networking company in Southern California. Now we are on entirely different coasts, separated by a continent, but still keep in touch electronically. For several months now, we’ve been episodically discussing the iPad, what it might or might not do, and sharing odd bits of obtuse geekiness. Agreed, it’s not a laptop, but the weird thing is, its more than one. Here's my thoughts: I have a 2006 MacBook Pro Core 2 Duo with 3GB of RAM and it can do anything I need except it has limited battery life and it’s heavy to haul around, but a great machine. I have a "hackintosh" Lenovo S10 (Intel Atom-powered) netbook running Mac OS X 10.6.3 with a 9-cell battery (8 hour battery life although I've never tested it) and an SSD [flash RAM-based solid state drive] to help speed it up. The thing rocks, runs every major application I need (it can even run VMWare Fusion), hooks up to an external monitor and so on. But it has a tiny screen if I use it sans monitor. If I were to go on a long trip I'd take the netbook for the size and portability and battery life. Downside is it can't play videos as well as the MacBook Pro and the little keyboard is OK for typing (though with practice I can scoot along pretty good on it). 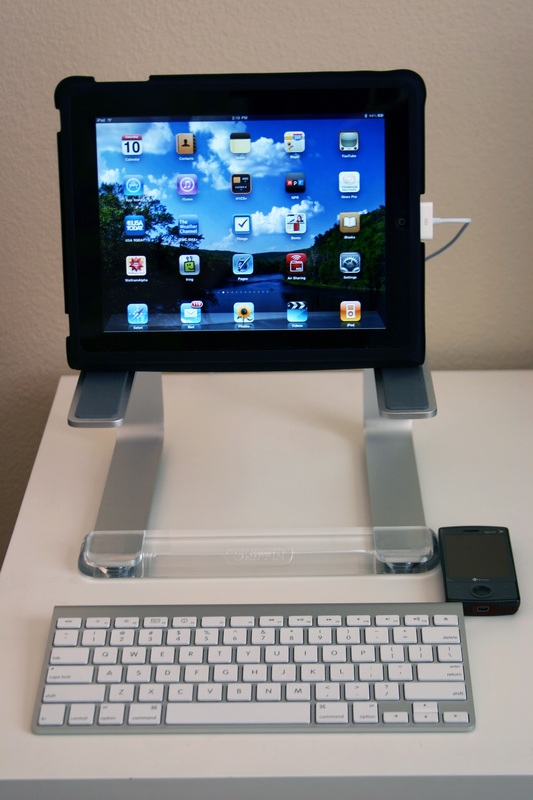 It is the main machine I use for backing up and syncing the iPad. It's probably closest to the netbook in terms of screen size and so on but with one big difference, the signature iPad pinch-to-zoom the netbook can't do, so the screen size suddenly doesn't matter because something interesting can be zoomed for use. Add to that the external Bluetooth keyboard and you can type as fast as you need. Battery life is a confirmed 10 hours. The iPad fits in my go bag like a book, and all the killer apps bring it head and shoulders above both the netbook and the MacBook Pro. It’s really all about the app at this point; the hardware is the platform and the app makes it whatever it needs to be. Lastly, my iPad is Wi-Fi only, however my cell phone has Internet connectivity and I can run software on it that turns it into a "MiFi" [compact wireless router that connects to the cellular data network] and can share via ad hoc Wi-Fi networking to the iPad, making the iPad a go anywhere device. It really is a big deal in my mind; suddenly the iPad is the main machine with the netbook or MacBook being the secondary machine or only used for heavy lifting (HandBrake, etc). Anyway, those are my thoughts after using the iPad since Saturday morning. I'll keep you posted! Larry’s iPad, wrapped in Apple’s protective case (which doubles as an easel), resting on a Griffin Elevator stand. An Apple Bluetooth keyboard speeds typing, and an HTC cell phone, running special software, serves as a wireless Internet router. Why would the iPad’s mere existence spark a revolution? Consider Star Walk, a $4.99 application for the iPad. Install it, walk outside, lift up the iPad toward the sky, and it draws a map of that portion of the sky and annotates it for you. Can’t tell the Big Dipper from Orion? Now you can, using the GPS capabilities of the iPad, the large screen, and a reasonably clear sky. Take a look at the video, listed in References at the end of this article; this app needed the iPad to be invented. The Fossil bag can carry both the iPad and all of this stuff, plus the Lenovo “hackintosh,” and is small enough to serve as carry-on luggage on an airliner (minus the Leatherman; TSA classifies it as a potential weapon). For those of you who may have heard that the iPad is not “geeky enough” to satisfy the technical literati: ha! Yes, it is a user-friendly, portable video player or music player or game player or Web browser or E-mail reader or book reader or photo album. But it doesn’t have to be that easy. Soon Dr. Horrible will be able to use the iPad to try and take over the world again, (upgrading from an iPod touch), prankster hackers will use iPads to break into Fox News and make it sound ridiculous (well, more ridiculous), and crazed hobbyists will use the $500 devices to control $20 toy robots. The iPad is, so this app can do.